While Victor Pelevin dives into absurd postmodernism, Yevgeny Yevtushenko remains one of the few “living classics” of the 20th century. Victor Pelevin’s nine novels and 10 collections of short stories offer a combination of reality, fiction and the absurd together with deeply ironic language that vivifies postmodernism. They have won him the title of contemporary writer “Number 1” in Russia. His popularity, accessibility and appeal to the realities of today perplex venerable figures in academic literary studies: some ignore him, while others place him on par with such writers as Nikolai Gogol and Mikhail Bulgakov. In a 2009 poll conducted by Openspace, a reputable online magazine, Pelevin was considered the most influential intellectual in Russia, even though he does not push any kind of ideological agenda – he doesn’t even appear in public and is always photographed wearing sunglasses. Pelevin’s interviews, given exclusively via e-mail, become the same kind of post-modernist project as his prose. This has given rise to rumours that Pelevin is the collective pseudonym of a non-existent person, and that aura of a righteous terror envelops the author to this day. Pelevin was awarded the prestigious “National Bestseller” prize in Russia for his novel DPP NN in 2003. He is also a three-time winner of the Big Bok prize and is a Richard Schoenfeld Literary Prize laureate for the novel Generation P.
A natural-born illusionist, Pelevin takes the facts of contemporary Russian reality as a starting point, only to plunge his heroes into an absurd world beyond, woven from symbols and mythology, wild imagination and dark humor. In his most famous novel, Generation P, the main character discovers that the Russian government is a 3D computer model and the Kremlin becomes the fruit of an all-out conspiracy theory. Many of Pelevin’s main characters search for logic in a world mired in frenzied consumerism and the manic pursuit of money and power. They try to find their place in the surrounding madness only to discover that behind that madness lies something even more incredible and confusing. This could explain Pelevin’s meteoric success. The line between contemporary Russia and the absurd reality of his books is so fine that the term “Pelevenschina” has come into wide use, and not only in relation to literature. At 79, Yevgeny Yevtushenko remains one of the few “living classics” of the twentieth century, representative of the outgoing generation of poets from the sixties. In his interviews names like Voznensky, Brodsky, Okudzhava, Pasternak – a pantheon of great Russian poets, about which most contemporary readers know only from textbooks – pop up. His work really took off during the Khrushchev period and the thaw, a period marked by idealistic disposition and a genuine shift in the Soviet frame of mind. One of the symbols of this time is poetry readings in the hall of the Moscow Polytechnic Museum, which was packed to capacity: Rozhdestvensky, Akhmadullina, Okudzhava, Voznesensky, and Yevtushenko were the voices of freedom which were so essential to a generation with high hopes for the future. The true anthem of this new era was Yevtushenko's poem The Best of a Generation and his Highway of Enthusiasts collection. From his earliest works, the poet declared his rebellious, fighting spirit and his civil-ideological position. His poems reflect real historical facts and have themselves become scandalous public and literary events: Babi Yar (1961), Heirs of Stalin (1962), A Letter to Yesenin (1965), The Tanks are Going through Prague (1968), The Afghan Ant (1983), Farewell to the Red Flag (1992), Empty Swing (1994), and School in Beslan (2004). Despite his ideological position and the human rights campaigns, Yevtushenko has always been able to exist harmoniously and work under any regime, causing suspicion, rumors and criticism. However, this has also allowed Yevtushenko to reflect the changing picture of Russian life in his poems: the thaw of the 1960s, Brezhnev's stagnation and Perestroika. But the realities of Russian life were not his only inspiration. Other well-known poems include Under the Skin of the Statue of Liberty, Bullfight, The Italian Cycle, Mother and the Neutron Bomb, and his personal favourite, Dove in Santiago (1978), a poem in written verse, composed after a trip to Chile at the height of Pinochet. Yevtushenko is also known to have a keen interest in film: in addition to acting and writing for the screen, he was writer, actor and director of the films Kindergarten (1983) and Stalin’s Funeral (1990). 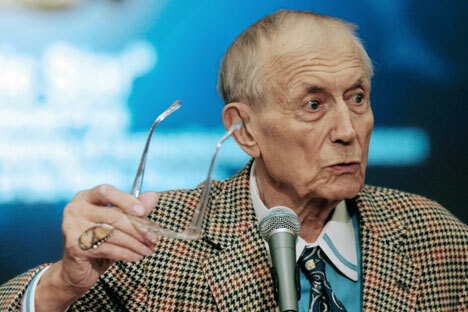 Yevgeny Yevtushenko is an honorary member of the American Academy of Arts and the Academy of Fine Arts in Malaga. He is also a member of the European Academy of Arts and Sciences, Emeritus Professor “Honoris Causa” of the New School University in New York and the Royal College in Queens. In 1984, he was awarded the State Prize of the Soviet Union for the poem Mother and the Neutron Bomb. He is a laureate of Tizian Tabidze (Georgia), Ianis Rainis (Latvia), Fregene – 1981, “Golden Lion” in Venice, Enturia, Triada, “Academia SIMBA” prizes (Italy), and recipient of the prestigious “Grinzane Cavour” literary award (2005, Italy, Turin) “for his ability to convey the eternal themes through literature, especially to the younger generation.” He is laureate of the Academy of Russian Television (“TEFI”) for best educational program “A Poet in Russia is More than a Poet” (1998), the Walt Whitman Award (USA), and the International Botev Prize (Bulgaria, 2006). He has been awarded the Order of Merit of the 3rd degree (2004), The Order of the Red Banner of Labour (1983), Order of the Badge of Honour (1969), The Georgian Order of Honour (2003), State Order of Romania “for outstanding cultural achievements,” The Order of Bernardo O'Higgins (Chile), The Medal of Honour of the Soviet Foundation for Peace, The Presidential Medal of Freedom (USA) for human rights activism, and a special award for his services by Yale University (1999). In 2006, he was awarded the Medal of Raoul Wallenberg in recognition and appreciation of outstanding contributions and achievements in the humanitarian sphere. His refusal to accept the Order of Friendship in protest against the war in Chechnya (1993) resounded around the world. His novel “Don't Die Before You're Dead” was named best foreign novel in 1995 in Italy.